Underdog Wine Co.'s Ryan Sciara selects 12 gift-worthy holiday wines that will thrill everyone from your father-in-law to your hair dresser. The best way to shop for holiday wine gifts is by the caseload, for two reasons: Most shops will offer a case discount and that way you always have something on hand when you need it. 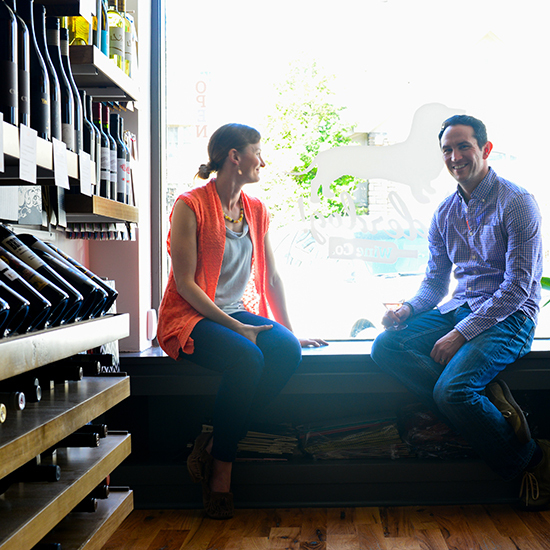 Last April, Ryan Sciara opened Underdog Wine Co., an extraordinary shop in Kansas City’s Crestwood neighborhood. The teeny shop (formerly a hair dresser) is packed with small-production wines and craft beers and spirits. We tapped him to give us his selections for a dozen bottles that will make superb gifts for all the random gifts you need to give this season. I discovered this wine the week before I opened the shop and was blown away. I thought, “this is going to be the wine that will convert people who only want to drink California Cabernet.” This wine from Portugal is 50% Alicante and 50% Cabernet and it’s this big chunky bottle with a wax-dipped top. The alcohol is 15% and I’m not usually a fan of wines with high alcohol, but to me, this wine is the ultimate iron fist in a silk glove. It’s inky dark, but there’s so much finesse that you can lose sight of the fact that it’s that powerful. I’ve been trying to champion Portuguese still wines and I think they’re finally starting to scratch the surface. I think the only other name that would be good for a wine like that would be, “close but no cigar.” Close only counts in horseshoes and handgrenades. It’s a subliminal message of always strive to be better. (Laughing.) The winemaker, Andre Mack has a great story, the wines are great and he’s amazingly brilliant with his label designs and this wine only costs 20 bucks. It’s a blend of Syrah, Tempranillo, Cab and Merlot. Half of the grapes are from Washington and half from Oregon, I think that’s probably what Andre meant by the name Horseshoes & Handgrenades. This is old school. When I think of “the boss”, I’m thinking of the guy in the office with a smoking jacket. This is a 1994 vintage of Gran Reserva Rioja that’s drinking beautifully right now, but still has a ton of time left. The label is old-school Heredia with gold foil, which means the packaging is super impressive alone, nonetheless the chance to give somebody a 20 year-old wine. And who knows how old your boss is? He might not have 20 years to age something, so give him something to drink now! This vintage is amazing. I’m on a big Rioja kick right now. I’ve been buying older Riojas on Wine Bid because with that much age on them, they drink a lot like a Burgundy. You can count on this year in, year out. It’s a solid value. It’s an unoaked Malbec and it doesn’t have any of that fake oak stave, sappy, one-note characteristic that a lot of Malbec can have – it has more complexity, while still being juicy and easy-to-drink. People who like Merlot will like it, people who like Cabernet will like it. And for 10 bucks, you can buy a whole case of it and just hand it out to your neighbors. I just started carrying this and I got it on the Monday before Thanksgiving and the first day, before I’d even taken it out of the box, we’d sold two cases. I just love this wine – it’s just really pretty, elegant, feminine Pinot. And who doesn’t like Pinot? This is a classic. It’s the first that I started collecting. I have a vertical going back to 1991. It is the quintessential American wine. Not only the winery, but that wine is what got me into wine and giving it to my father-in-law would be letting him into my little history with wine. We have it in magnums, too. It’s the Beautiful! If you’re gonna say something to your wife, say it right there. This wine is massive, but restrained at the same time. Most of Charles Smith’s wines are just big, but this is big and beautiful. I think he might have even named the wine after his wife. I’ve given that to my wife and she sees it. You’ve gotta tell her she’s beautiful, so why not do it with wine? And I get to drink it, too. Even better. It's like giving them a bottled apple – a fresh green apple with lime zest and cream. You could also give a bottle of La Captive Calvados (it has an apple inside), but maybe it’s not good idea to roll into school with a bottle of hard liquor. My daughter goes to a French immersion school, so it’s a French wine for a French teacher. This is a blend of Chardonnay, Sauvignon Blanc, Riesling and Nascetta. Nascetta’s an obscure grape from Piedmont that’s only had DOC status for the last 10 years or so. It’s a really intriguing wine. Often people will come into the shop and ask for recommendations and they’ll say, “I like Chardonnay but I don’t like oak” or “I like Sauvignon Blanc, but not the really pungent, grapefruity style. The La Baudana sits right in the middle. It has a just a touch of sweetness that makes it an amazing food-pairing wine. Every time, people go nuts over this wine. There’s bright acidity, there’s minerality, some savory notes of rosemary and thyme, it’s really fragrant, it smells really pretty. My mother-in-law would love this wine. People always come in and say they want a bottle of Champagne. And I say, “do you want true Champagne or do you just want some bubbles?” And they say, “well, what’s the price difference?” And I tell them, “true Champagne will start around $40, but there are other great bubbles from around the world – even some from France—for 12 to 15 bucks.” And that’s what they’d rather have. There’s a little bit of little Chenin Blanc in it that gives it an appley, limey sweetness. And the packaging is really elegant, compared to the Cavas and Proseccos at that price. Shane’s one of my best friends in the wine industry. I love all of his wines, but the Grenache Blanc is such a pretty- smelling wine, that it made me think of a hair dresser where you walk in and you just get all of these aromas that stick with you. This wine smells really pretty—tropical, honey, beeswax – really intense aromatics. For someone who wants Chardonnay or something on the fuller side, I go with this because it’s more interesting and has more complexity. I love the texture of this wine – it’s a little waxy, with some chalky minerality. We hear all the time that customers want a wine with no sulfites. This wine is imported by Louis Dressner and I love selling those wines. It’s all natural, no sulfites added, no acidification, no chaptelization. It only has 12% alcohol and I think sometimes people might get a headache after drinking and will think it’s sulfites, but it probably is also from a wine with higher alcohol. Annnd I love Chenin Blanc.